Have you been feeling the effects of our global transformation these days? I know I have. I can’t help but think that many of us are feeling grief on some level in the midst of this metamorphosis. The need to feel safe and secure is part of being human. However, we are now living in a world surrounded by continual change and uncertainty. The systems and constructs that once defined our world are under evolutionary reorganization. What we once relied on as being “normal” does not exist any longer. With the onslaught of alarming occurrences in our evolving “new reality” we are surrounded by unprecedented, storms, earthquakes, fires, the threat of nuclear annihilation, terrorism, political impotence and instability in our leadership, the list goes on. In this volatile world that “appears” to be gradually collapsing around us we’re finding that the sense of security we may have once felt has become more elusive or non-existent. Despite all of this I am heartened by a possible silver lining. I am seeing a space for surrender to a higher awareness awakening on a global scale. Surrender may be our saving grace. The days of complacently and feeling the safety of the known are behind us. We as a people are slowly starting to wake up to the divine nature that exists within and around us. Many are starting to feel more empowered and are coming together to help one another and the planet. The experience of losing my husband to suicide and my journey through grief over the past five years mirrors all of this perfectly. My loss felt cataclysmic at the time. The world with my husband and son at the epicenter that I came to rely on for 18 years crumbled around me in an instant when I found him dead. Life as I knew it with my false sense of certainty was no longer an option. I was faced with a choice. I could resist or I could embrace this change and my loss seeing it as an opportunity to evolve, grow and ultimately help others by sharing what I have learned. I chose rebirth. It hasn’t been easy but the alternative of holding onto the past and what was is far more painful. This birthing process is a delicate balance of commitment, allowing, surrender and trust. Resistance is sure to raise its hand from time to time. It will do its best to be kept the status quo. There is comfort in holding on to the perceived security of what we know even if it no longer serves us. We can listen as our resistance insists on being heard, even giving it a space to sit at the table. Perhaps we can give it a new job. One of designing something entirely different. Something that could support and propel us in ways we may not have imagined. Then we can be on our merry way with the business of leaning into what is present and guiding us in any given moment. This is the gateway to our reemergence as a newly empowered individual. One of the many gifts that grief can bestow upon us if we are willing. So the question remains: will we be willing to do this on a personal and planetary level? Will we be willing to step into the void trusting in our innate wisdom to guide us through this unfamiliar territory moving forward? The ever presence of change and love are the only things we can count on. Perhaps we could re-direct our fears and yield them to LOVE the ultimate authority of the Universe? I think if we were able to make that shift as individuals our world would follow and we would all be living in a very different place. Change is inevitable. Maybe instead of resisting and fearing these dreaded changes we could let the fall season serve as a reminder that there may be another way of looking at this. We could let the trees with all their wisdom be our teachers showing us how we can gently and effortlessly release that which no longer serves us. When we are able to do that we allow for an opening to re-awaken just as the trees explode with an abundance of new growth in the springtime. I invite you to find comfort by imagining that change of all kinds can actually be exactly what we require. Through our collective thoughts we are creating our internal and external realities. We all play a part in ushering in this long awaited re-birthing process on our planet. Regardless of where you come from, where you are on your journey or what your beliefs are this is the time to remember the light of your soul and the love that exists within us all. 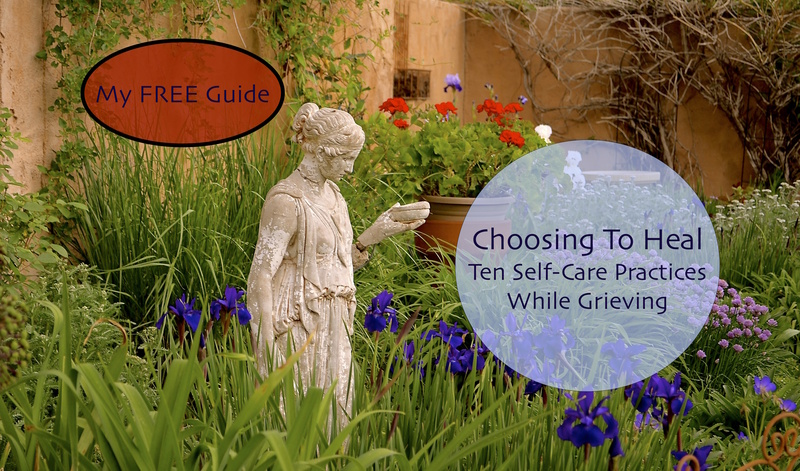 ~Get my FREE Guide: Ten Self-Care Practices While Grieving and FOLLOW my blog with my latest blog posts delivered directly to your inbox. Click on the SUBSCRIBE button at the upper right side of this page or below, depending on your device. I agree with all you are saying. As I have seen many changes through the years, The largest change is the respect for other People, seems to have evaporated. There is one Golden Rule Treat people like you want to be treated and a little praise goes a long way. When it seemed like the darkest of times. There was always a shining light at the end of the tunnel. And I ‘am sure The shining light will be bright once again we all need patience and Tolerance for each other and start treating all people the way we want to be treated,no matter what Nationally or color they are, we all want to be treated with respect and praise when we do a good job. No one is perfect but with a little understanding we can teach each other and make a better world. Appreciating your optimism, “I am seeing a space for surrender to a higher awareness awakening on a global scale. Surrender may be our saving grace. ” Tenderly written. This spring, I experienced the suicide of my mother’s sweetheart of 9 years. He and I weren’t close but had found common ground: books, collecting rocks, and cooking Mexican food. I cared for him because he made my precious mom happy. That’s all that mattered. His death unleashed a tsunami of everything raw, secretive, resentful, and messy. There was fall out–I’ve emotionally separated from three close family members as a result. How they showed up during this time was…well, I don’t choose to be a part of that toxic, narcissistic energy. Wishing you expanding peace and comfort, Kara or is it Kara Hope? What a beautiful, beautiful post, and so full of hope and light. Welcome aboard! You are an extraordinary person! That is so true! We ask for change, but it often comes about in ways we don’t like or expect, and we resist. Being open to the unexpected gifts, or silver linings that come from difficult situations can make a big difference. Accepting the darkness can be a way to prepare for the light, and be a catalyst for change and transformation. Beautifully written!